Terrance Spurlin squeezed a sharply hit groundball through the middle of the Outlaws infield. The hit was enough to score Malik Williams giving the Mustangs the lead in the second inning. Unfortunately, that was all the offense Saint Joseph could muster on Friday as they fell to Joplin 5-1. The first 500 fans in attendance received a Mustang tote at entry Courtesy of The Whole Person Home Health Care. St. Joe starter Matt Mulhearn pitched four-scoreless innings before giving up three runs in the fifth. He collected seven strikeouts during his outing. The Outlaws threatened to take an early lead in the top half of the first, but the Mustangs defense clamped down. Zachary Smith threw a strike from left field to beat Joplin’s Blake Wynn at the plate, keeping the score tied at zero. Fans in the stands took advantage of Friday Night Lites with $1 Miller Lite, Coors Lite, Bud Light, Busch Light; $2 drafts. Outlaw’s starting pitcher Dalton Weaver threw nine innings, giving up sixth hits, with nine strikeouts. The Mustangs struggled to find a rhythm at the plate all night. Phil Welch was home to some special guests as Rally celebrated his tenth birthday party. Remy the woolly mammoth from Remington Nature Center, Bobby the Bearcat from Northwest Missouri State, Andi the Armadillo from Texas Roadhouse and the Chick-fil-A cow partied with fans throughout the contest. The loss ties the three-game series at one a piece. The Mustangs will look to rebound in the decisive game three on Saturday night. Mustang’s fans will look to cash in on Hy-Vee Fuel Saver Fridays next week. If the Mustangs win, bring your winning ticket stub to St. Joseph Hy-Vee within seven days and receive a 20¢ Fuelsaver! Alex Phillips went 2-4 with two singles. Malik Williams went 1-4 with a run. Terrance Spurlin went 1-4 with an RBI. Alex Phillips leads the MINK league in hits with 21. The Mustangs fall to fourth place in the league standings with the loss. 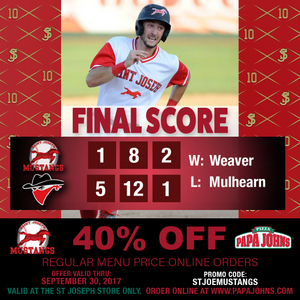 The Mustangs will be back at Phil Welch at 7 p.m. Saturday for the final game of the three-game series against the Outlaws. The first 500 fans in attendance will receive a limited edition 10th Anniversary Mustangs T-shirt courtesy of Carriage Square Living and Rehab. Don’t forget about the Mosaics Life Care Fireworks Spectacular immediately following the game. For all information on Mustang’s baseball visit stjoemustangs.com, follow the team on twitter (@StJoeMustangs), like the team on Facebook (St. Joseph Mustangs), and follow the team on Instagram (St. Joe Mustangs). For a glimpse at the game day experience follow the Mustangs on Snapchat (stjoemustangs09).